Euskal Oiloa Chicken Forum / Link to "Most common defects in Euskal oiloa"
» Link to "Most common defects in Euskal oiloa"
Link to "Most common defects in Euskal oiloa"
The ears should be bright red, without the presence of white. Except Beltza variety, the presence of black at the peak is considered a minor defect, most marked in the varieties and Marraduna Zilarra. Beltza Variety, the trend is toward the color black. In general females may tend towards the legs/toes being white. Yellow may lose intensity as they start to lay. Legs a colour other than yellow is considered serious flaw. The comb should be simple, medium size, straight and steady. Sample of blood, fingers bent considered a defect in the show, but does not affect reproduction. Re: Link to "Most common defects in Euskal oiloa"
-We have also seen Clavell Combs, the side sprigs of the carnation comb seen in Penedesencas. -We have seen Blue legs, and white legs. -There have been bent toes for sure, and even a few stubs on toes. We haven't seen them but a few of this years offspring have reported to have them. Because of the sibling breeding we had to do this year, we expected recessives to pop up and they are! So a lot of this generation may be discarded and the best birds which should be pretty nice, to be kept for breeding. So there are some tiny gene-pool challenges here! I think we are looking forward to some breeding ideas for this awesome breed from those more experienced breeding chickens! Thanks for the post. Very helpfull. Here is a picture of a young rooster with side sprigs. The side sprigs can vary from teeny tiny to quite impressive. As I understand the genetics, side sprigs are a recessive trait so both parents need to carry the gene (and will not show any evidence of side sprigs) for the offspring to have side sprigs. Please correct me if that is incorrect! Well I know I have had a lot that had crooked toes, mostly the roosters. I had found homes for them as did not want use them for breeding. Was wondering if there is another breeder that could add a little "bleach" to gene pool that are not so closely related to mine??? 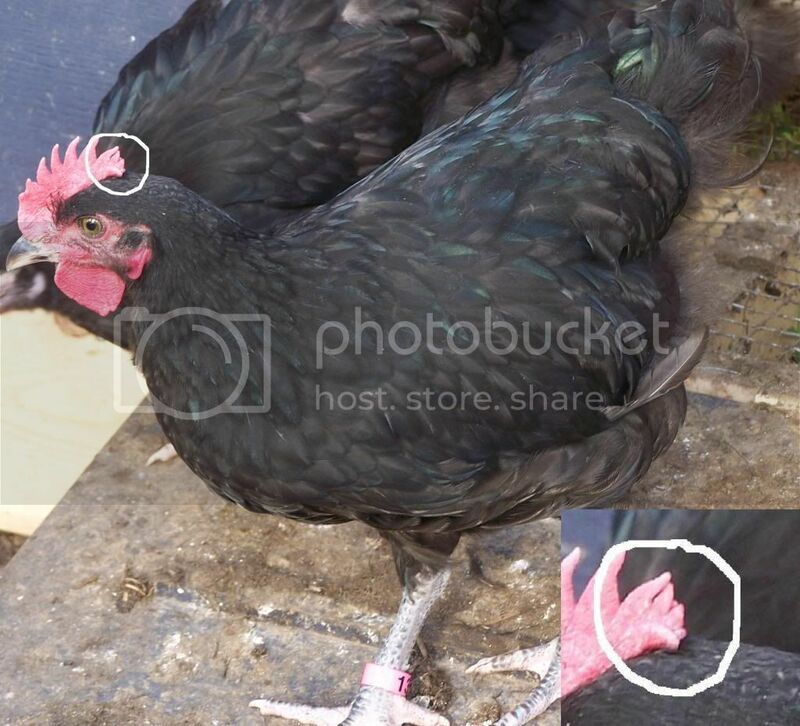 With regards to white tail feathers on the roosters, when would they normally come in if they are going to? I had a number of them too mostly cockerels too. I even had 2 that had both feet curled! They do however grow just the same and do taste delicious. There's a lady down in Tilbury that has some originally from Claire but a little further removed now. She was selling hatching eggs this spring. poplar girl that would be great if you would have some for next year. Gubi I also had one fellow that both his feet were curled in, at first I thought it was something to do with a incubation problem until I read a link on EO's and some genetic defects in them. I think the white takes a while like 4-5 month at earliest to be sure for the adult tail feathers. Speckled Jim's 2 big sickle feathers in the middle of the tail are white and took more like 6 months to come in if I remember rightly. It's pretty well till they get that long glossy saddle feather stage underway. Thanks got it and mailed her! the end of the comb is not flat but has tiny points to the side. Ok, I think I get it. So basically they need standard Single Combs without any deviation? Uniform Points on the comb. Sides of comb smooth with no points or bulges"side sprigs"? 6 to 7 points on Comb? Yes, this is them on a black penedesenca - not as many as he should have even! On the basques, if there's a single on or one on each side, the side sprigs seem to be about 1cm up from the bottom on the back of the comb. Side sprigs are a common fault on all single combed breeds as it is recessive and easily masked until two heterozygous birds breed and ti shows in the offspring! Got it now. Thank you for the help.